The 8 inch ECO Funnel with Rectangular 20 Liter Nalgene Carboy/Jerrican (Nalgene 70mm screw cap) and Secondary Container features a latching lid with gasket to keep fumes contained. 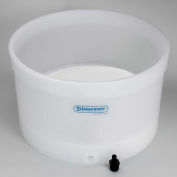 A removable large particle filter catches stir bars or other items. The 11" funnel stem reduces chemical evaporation, and the secondary air lock tube helps prevent over-filling. 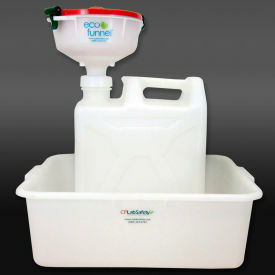 The ECO Funnel® is the ultimate lab safety product for collection of hazardous liquid waste. 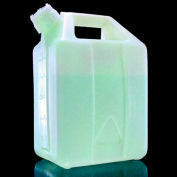 Its unique, patented design performs two functions, acting as both a sealed waste container and a solvent funnel. 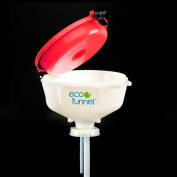 The 8" ECO Funnel® is made of HDPE and has a 2000 mL fluid capacity. 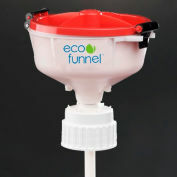 This solvent funnel is designed with a custom screw cap which secures it to a specified waste container. It also features a gasket inside the lid and a sturdy positive latch which ensures the lid remains securely closed. 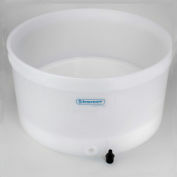 A filter is also built into the interior to reduce the loss of stir sticks or other particles in the waste liquid. 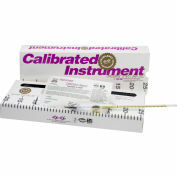 An 11" stem also reduces chemical evaporation of hazardous solvents in the lab.